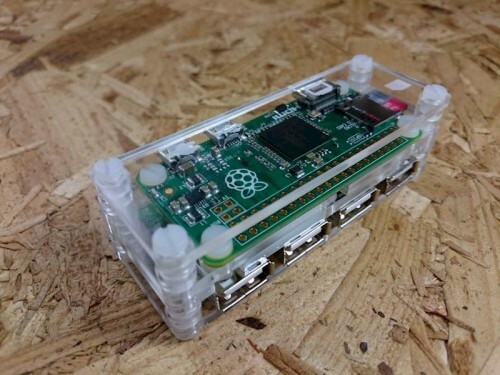 Pi Zeros are still selling out as fast as they go on the shelves. If you’re still looking for one, keep polling Adafruit, Micro Center, Pimoroni and The Pi Hut – they’re all getting stock hot from the factory. We hope supply and demand will even out soon! If you’re holding one in your hot little hands and are looking for some project inspiration, here are some projects we’ve spotted this week. Let us know in the comments if you’ve done something yourself that you think we might like to feature! Follow the links for more details. First up, here’s ProfExtreme’s musical Tesla coil. It’s playing a MIDI file. Don’t lick the sparkly end. Tesla coil run from pi zero plays Popcorn from midi file on zero. Stuff with Kirby (more info at this link to YouTube) has made an AirPlay device with his Zero, a Pimoroni pHAT DAC, and Shairport, so he can stream music from his devices to speakers elsewhere in the house. This is a great video tutorial – thanks Kirby! Matt “Circuitbeard” Brailsford has adapted Frederick Vandenbosch’s USB hub mod, and built a simply gorgeous little USB hub integrated with a case for his Zero. These aren’t for sale, but you can make your own from off-the-shelf parts: he’s provided instructions on his website. Frederick Vandenbosch didn’t just start off the USB hub idea: he also made this thing of beauty. It’s a connected information display, and it’s just…adorable. Find out how to make your own. My second Raspberry Pi Zero project! It’s a programmable display, allowing you to display virtually anything. For this demo, I programmed 3 different screens: time & date, network settings and social media subscriber count. You could use it to show weather information, email, latest tweet, etc … Have feedback on this project? The neatest and most satisfying Retropie example I’ve been able to find comes from Craig “W3ace” on Thingiverse. 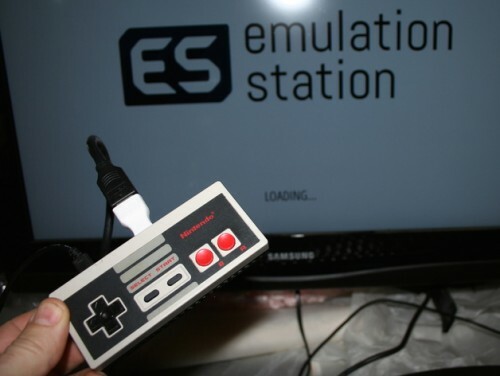 This is a 3d-printed NES controller (you can do the same with a genuine shop-bought one) with a very tidy Zero integration. Find out how to make your own here. Wordclocks are always a favourite in these parts, and this tiny example is the first we’ve seen made with a Zero. 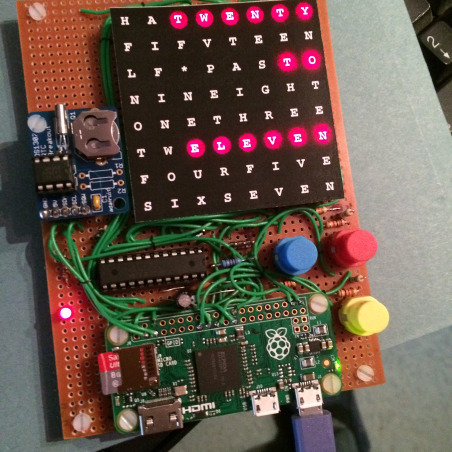 Dave Saul shows it off here: there isn’t a full list of instructions, but we’ve other wordclock projects here you can borrow from. 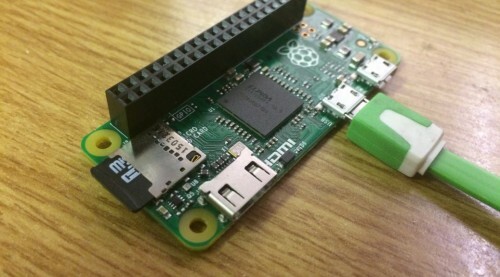 Andrew Mulholland has been working on making the Pi Zero a USB device, so you can program it from another computer. Less glamorous than musical Tesla coils, arguably, but really useful. Read more here. Les Pounder has equipped a very topical robot with a Pi Zero. This next project is TOTALLY ILLEGAL in the UK and in some other countries, where the FM spectrum is locked down: please check your local radio authority before you go ahead and make one. But we thought it was really cool for those who live in other jurisdictions: here are Make’s Pirate Radio throwies. Full instructions here. With the announcement of the Raspberry Pi Zero, we decided to revisit one of our favorite projects, the PiRate Radio. And with the smaller size, we turn it into a Pirate Radio Throwie. Full Project Instructions: http://makezine.com/projects/pirate-radio-throwies/ Make your own USB OTG Cable: http://makezine.com/projects/usb-otg-cable/ Music: http://buttkickermusic.com/ ———————————————————— Visit us on the web! 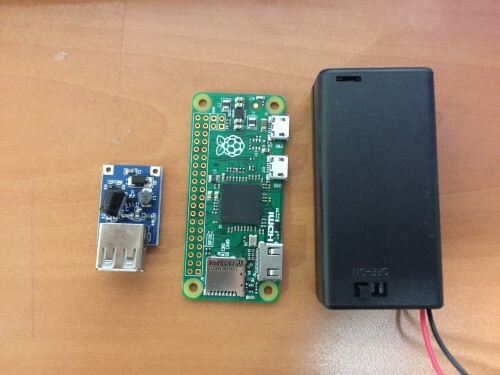 Finally, ModMyPi has a very nice tutorial on running your Pi Zero off an AA battery pack: especially useful for people making wearables projects. We’ll be rounding up more projects as they appear – drop me a line at liz (at) raspberrypi.org if you’ve got something you think other Pi users would be interested in. Thanks Les – I’ll update the post to reflect that! Any time! Your little info display’s probably my favourite of all of these projects; there’s just something about the form-factor. Lovely piece of work – thank you! I liked this one too. It’s beautifully compact. I’d also think it would be possible to adapt a number of screens from my own information screen project (https://www.raspberrypi.org/forums/viewtopic.php?f=41&t=121392) to work on this one. Have been trying to get hold of a Raspberry Pi Zero since their release. Have put myself on the notification of the sites mentioned once again. No luck yet. Live in a small community in northern Michigan, US. Would like to purchase 20 of them to give to students in the local school (Northport PS) in Northport, MI US. While there are still shortages because demand is so high, we’re asking stores to limit sales to one per customer, so a classroom set probably won’t be achievable this quarter. TBH, Zero’s probably not the best option for teaching anyway: it’s relatively slow and inflexible next to the Pi 2, and getting started with it is a much steeper learning curve for beginners. Your logic is scarily close to “I have never seen a wombat, therefore they do not exist”. I was lucky – was checking twitter when they come back in stock at pimaroni – ordered the bundle with adapters and case for around £14, and had it 2 days! Thank YOU – we loved it! Please can we attach the Midi-Tesla-PiZero to the PiSynth you had last year for the birthday party? I have a Pi Zero from my subscription to the MagPi. Thanks for featuring my word clock, I plan to get some instructions and the Python code on a Github over the weekend. Would the device (gadget) mode be as standard in later raspian versions? And if it does, would there be presets for all compatable modes? Also some in depth examples would be good, like gpio monitoring/access via usb. Certainly going to try these project on my Pi Zero. IF I HAD ONE. I developed a web enabled fish tank on the PiZero. Monitors water and ambient temperature to a SQL database, with web access. Controls the white & blue LED lights over a 24 hour period. Emails any temperature warnings to my phone. Had to change to a Pi 2 so we could have streaming video! Next project is a GPS derived, head up display, speedometer. I’ve got a two digit LED display, just working out the library for mirror image befor the USB GPS comes. I got my hands on a second pi zero. Both from Microcenter. I found a ABS box the width of the zero, 1.5 x as deep, and an inch (3cm) high. Just enough space for the zero, an adafruit p910 1.5 inch LCD screen (4cm), and empty space in between for possibly a battery and charger. It would be portable. So far I have no use for it except that I built it. The tiny composite screen 160×240 is limiting. So there I built a portable I-don’t-know-what. I put a little PiZero bot together last month (Video at https://www.youtube.com/watch?v=u38X-v4sQzk ). Unfortunately I managed to burn out the AdaFruit PowerBoost last night when testing a new, smaller LiPo battery (oops!). I was able to find a HDMI Micro female to HDMI mini male 8 inch cable online, no adapters needed. With that and a home made USB micro female to split USB male I am using a Zero on an Atrix lapdock. Just waiting to see what the battery life ends up at. The PI B+ got 5 hours. The Adafruit I2C/SPI OLED displays work really well in combination with the Pi Zero! Well done Zeb … I think you’ve been really fortunate … can’t wait to catch you up! I’m using a model A to prototype a radio project idea .. I’m hoping that swapping the cables and sdcard over will instantly give me a smaller footprint when completed. I’ve been thinking how expensive ramdrives are. I want (later when I can buy many Raspberry Pi Zeros) to make multiple ramdrives to use for swap over usb mass storage device (link up in this post). Then for each of them I would make a usb mass storage device in tmpfs (about 400 MB, only console at boot), and automatically give them a unique repeatable at every boot UUID. Very cheap (Pi Zero 5$ + sdcard 1$ + USB cable 1$)*(how many). Neat idea, but obviously the limited bandwidth of USB will make this *much* slower than just adding extra RAM directly to your main computer. Yes, but very low latency and parallelism means far better than even an expensive usb 2.0 SSD speed (swap is slowed by latency). Did you ever see on a computer with swap on SATA harddisk after closing Iceweasel/Firefox with multiple tabs open how hard the desktop background draws itself from swap ? Clearly not 30 MB/s, more like 50 kB/s due to latency. I guess you could do the “automatically give them a unique repeatable at every boot UUID” by somehow calculating the UUID based on each Pi’s unique serial number, obtained from the output of “cat /proc/cpuinfo”. Thank you – will try all variants. Hello! How I configure a wireless keyboard+mouse in the same micro-usb of the Pi zero? Either use a “combo set” where both keyboard and mouse talk to the same (single) receiver dongle, or simply use a USB hub. Well done with all of these projects and really shows how great the Raspberry Pi is. The information display was my favourite and looked very cool. I need to make one now to look cool :) Thanks for all the ideas, so great to see what others can do. Here’s a liitle project I’ve been working on. I call it Pi Zero Radio and it’s basically a full internet radio station running on the Zero, with music playout, MP3 encoding and Icecast streaming all running quite happily on the little device. Demo here … https://www.youtube.com/watch?v=77EkUr-MDNk … hope you like it. After all the interest I got from the initial Post here featuring my WordClock I have now launched it as a Kickstarter – The Tempus Fugit WordClock. I should have a prototype built in time to show on the Sunday at the Big Birthday Weekend for anyone who wants to see it. Any idea of how to use USB webcam (usb camera) with Pi Zero? what drivers we need? I tried for one week and I have no result yet. Unable to use mmap. Using read instead. Have you considered raising the price until you are able to produce enough at $5? Pocket PiGRRL: is that an emulator in your pocket?